It is sometimes said that the Kremlin’s goal in Ukraine is either the country’s decentralization or federalization. That, in my view, is incorrect. The Kremlin could care less about whether a regional legislature in western Ukraine is competitively elected, selects a regional governor independently of Kyiv, raises taxes independently, or spends money independently. Nor does the Kremlin care particularly about the treatment of ethnic Russians or Russophones in Ukraine (although, thanks in no small part to Russian state propaganda, a great many Russians are genuinely outraged by the fate of their “compatriots” at the hands of the “fascist junta” in Kyiv). For the Kremlin, decentralization, federalization, or language rights are means to an end, not ends in themselves. That end, I remain convinced, is keeping Ukraine out of the Western institutional order in general, out of the EU in particular, and out of NATO above all because of the perceived threat the alliance poses to Russian national security. With respect to EU accession, the Kremlin’s is going to make Ukrainian economic integration with Europe as costly, and as prolonged, as possible, knowing full well that there is little appetite in European capitals for affording membership to such a large, unstable, and low-wage country, and even less appetite for spending a great deal of money on a country that is in the midst of an economic meltdown. It will use its (near) monopoly on natural gas deliveries, as well as trade and investment policy, to make Ukraine’s economic crisis as deep and protracted as possible, and it will try to make Western efforts to help Ukraine as costly and ineffectual as possible. Politically, however, Moscow is running out of options. 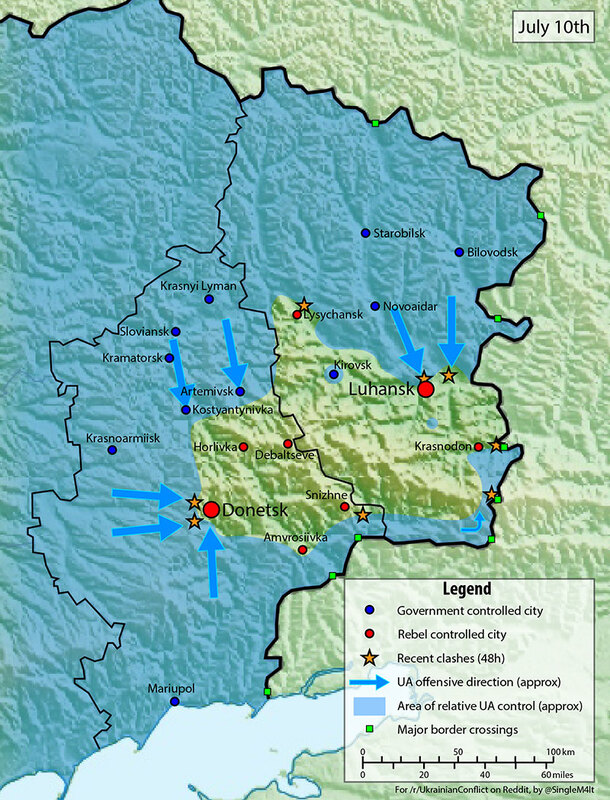 The failure of the uprisings in the Donbas to spread to other parts of eastern and southern Ukraine, and the Ukrainian military’s recent successes in driving the separatists out of Slavyansk and Kramatorsk, leaves the Kremlin with three paths for achieving its objectives, none of which is ultimately likely to succeed: (1) support an ongoing insurgency in the current zone of conflict (and perhaps beyond); (2) introduce Russian “peacekeepers” into the Donbas to establish a breakaway government (or governments); or (3) force Kyiv to negotiate a settlement that leads to the establishment of an “autonomous” region or regions that block Ukraine’s pivot to the West. These options are not mutually exclusive. What they have in common is that, if successful, each can keep Ukraine out of NATO for the foreseeable future, and each will make EU integration more difficult. Let me consider each in turn. As I argued in my last post, I will be surprised if Kyiv manages to put down the uprisings in the east in the coming weeks or months. The insurgents appear to be hunkering down in Donetsk and Luhansk and intend to make it as costly as possible for the Ukrainian military to take either city by force. They also appear to be planning raids and attacks on other parts of eastern and perhaps southern Ukraine. Luhansk and Donetsk are medium sized cities, and the Ukrainian military is going to find it difficult if not impossible to interdict the flow of fighters and weapons coming into them. It is also going to find it difficult if not impossible to fully secure its border with Russia (although securing the remaining border posts will likely make it more difficult for armored vehicles to cross the border, but armor is not particularly useful for insurgents engaged in urban warfare). If the Ukrainian government decides to assault either city, its military will not be able to use the heavy weapons and air strikes used in Slavyansk because of the risk of civilian casualties. Neither will Kyiv want to see the civilian population suffer in an effort to deprive the insurgents of food, medical supplies, fuel, electricity, and other critical provisions. The problem for Moscow, however, is that sooner or later Kyiv may succeed in defeating the rebels or convincing them to surrender. Moscow will likely be able to keep at least a low-grade insurgency going for months, but it cannot be confident it can do so for years. Trying to sustain an insurgency for very long also presents Putin with a serious domestic political problem, particularly if the separatists continue to suffer defeats on the battlefield. Putin, Medvedev, Lavrov, and other senior Russian officials have repeatedly stated that they have what amounts to a “duty to protect” Russia’s “compatriots” in Ukraine, and Putin’s authority is in no small measure dependent on his reputation as a tough guy who does not bluff and “wins” whatever fight he is in. Putin is already under pressure from Russia’s political right to intervene, and that pressure will grow if the insurgency continues and especially if there are major civilian casualties in Donetsk and Luhansk. When the uprisings in the east broke out in early March, the Kremlin doubtless hoped that the insurgency would extend well beyond the Donbas into other parts of eastern and southern Ukraine. It must also have hoped, and expected, a coherent insurgent government, or governments, to emerge to lead the insurgency, as happened in Transnistria and the other separatist regions in the early post-Soviet period. That has not happened, and the failure of a credible separatist political structure and leadership has been a major impediment to the realization of the Kremlin’s immediate goals in the region. I suspect that the reason for this is that most of the region’s existing political elite failed to support the separatists – they were less coherent than political elites in the Soviet-era autonomies, less certain that separatism was in their interest, and less convinced that a separatist uprising could prevail given the lack of popular support for secession or unification with Russia in Donetsk and Luhansk oblasts. As a result, the leadership that did emerge was not part of the Donbas patronage network but was comprised of previously unknown neophytes or imports from Russia who failed to garner much popular support. Moscow apparently tried to create a more coherent political leadership among the insurgents, but the effort failed. At any rate, the lack of a coherent political leadership among the separatists, and continuing divisions among the various factions and armed formations, has made a Transnistria-type outcome in the east much more difficult for Moscow to arrange. At this point, it strikes me that the only way we are going to get a Transnistria on the Donbas is if Moscow decides to invade and then sets up a political structure at its own initiative. The problem with an invasion, however, is that it is even more fraught with military, economic, and political risks than would have been the case two or three months ago. Ukraine’s military is now in a better position to resist, which means that any Russian intervention would entail considerably more violence. Economically, the Kremlin would be saddled with an even more expensive burden in the Donbas than it is facing in Crimea, as well as much more severe Western sanctions. Politically, an intervention now, especially one that meets significant resistance, would also risk looking like an act of desperation to Putin’s domestic audience, which will wonder why he waited so long to pull the trigger. Moscow’s preferred option at this point is probably a political settlement that realizes its strategic objectives by institutionalizing Ukrainian military neutrality. This has long been Moscow’s goal in Transnistria, and it was its goal in Abkhazia and South Ossetia prior to Russia’s war with Georgia in 2008. (Russia’s objectives in the Nagorno-Karabakh case are rather different, although there too Kremlin policy is driven overwhelmingly by strategic concerns.) To achieve this, Kyiv would have to agree to constitutional amendments that embed neutrality and give the country’s eastern and southern regions a veto over Ukraine’s foreign alliances. This solution, however, has also been made less likely because of the lack of coherent pro-Moscow leadership in Donetsk and Luhansk. But more importantly, now that Moscow has apparently taken an invasion off the table, Kyiv has little incentive to agree to “federalization” even if could find someone to negotiate with. Any government that tried to negotiate constitutional changes with the separatists would very likely lose power given the mood of the country. I doubt that even concerted pressure from Brussels and Washington could change Kyiv’s position on not negotiating with the separatists until they lay down their arms, and that kind of pressure is in any case unlikely given the divisions among Western governments on how to respond to the crisis. To sum up, Kyiv may be facing an extremely difficult choice about whether to assault Donetsk and Luhansk, but it is also true that Moscow has no good options going forward in Ukraine. My guess is that the Kremlin is going to try to sustain the insurgency (Option 1) for as long as possible in the hopes of eventually forcing Kyiv to negotiate a “federalization” arrangement with the separatists (Option 3). The only way that can happen, however, would be if the separatists managed to engage the Ukrainian military in long and bloody battles in Donetsk and Luhansk, battles that are violent enough to convince the Ukrainian leadership, and the Ukrainian people, that negotiation is preferable to fighting. If, however, those battles produce many civilian casualties, there will also be growing domestic political pressure on Putin to intervene. At that point, he may decide that he has no choice politically but to launch a “humanitarian intervention” (Option 2). Given that a negotiated solution is unlikely, I believe it is in the interest of all parties, even of the separatists, for the Ukrainian military to take Donetsk and Luhansk quickly and efficiently with minimum casualties. That strikes me as unlikely. There are reports that large columns of armor and heavy artillery are massing around Donetsk today. If the Ukrainian military finds itself struggling to take Donetsk and/or Luhansk the way the Russian military did in Grozny in 1999, we are in for a sharp and dangerous escalation of the crisis.